I got some dried woodears (black fungus) this morning from Aldi. I tried some for a quick stir fry of moo shu pork this evening. These woodears are pre-cut and thinner than those I usually buy from the Chinese supermarket. Once soaked I find them a bit bitty, ok for this kind of stir fry. I would not use it if I have to shred it very fine for some recipes. Tastewise it's fine. Now talk about this moo shu pork I had cooked. Moo shu pork 木須肉 is not commonly heard of in UK, but if you are in US nearly every Chinese restaurants and takeaways (or takeout in US) has this on their menu. Moo shu pork was introduced to US I guessed via the Taiwanese or Northern Chinese many years ago. Because some of the traditional ingredients were not easily available they had adapted it and it has become one of the most popular US Chinese dish. I have seen all sorts of non traditional vegetables go into this dish like bean sprouts, shitake mushroom, cabbage, brocolli etc.... It's kind of like a chop suey stir fry with anything they like. Also another thing is, US moo shu pork always serves in a wrap like a large duck pancake with a bit of hoisin sauce, I have also seen it wrapped with tortilla???? So what is traditional moo shu pork? This is a Northern Chinese stir fry dish, common in Beijing and Dongbei. It uses simple Chinese ingredients and is an everyday family dish with few specific ingredients. 1. Moo shu 木須 can mean the bright tiny sweet yellow Chinese flower called sweet osmanthus 桂花 (gui hua), so one of the essential ingredient is egg to look like this yellowish flowers. 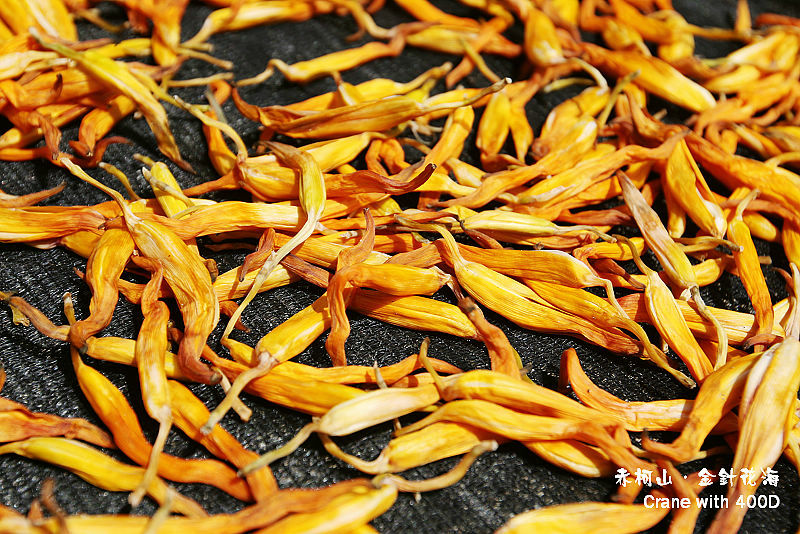 Another common ingredient for moo shu pork is dried lily flowers also to symbolise the yellow flowers. 2. 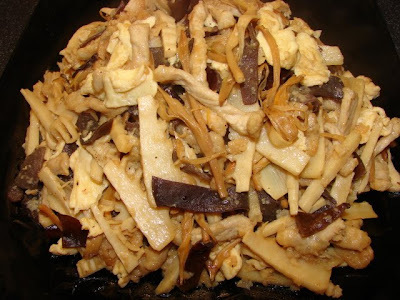 Some said Moo shu 木須 means woodears, so this makes up the next essential ingredient. 3. The last assumption is it means pork. So there you have it, 4 main ingredients to go with this dish. Other common ingredients are bamboo shoot, carrot and cucumber. I normally just add bamboo shoots. The next big query is the pancake. Wikipedia states moo shu must be served with pancakes, where is this come from? As far as I know, this only applies in US and Canada. Traditionally, I don't think this is true and I have never seen any of this recipe written in Chinese serving with hoisin sauce and pancakes. The mind boggles how a classic dish can be bastardised. So this is my version of moo shu pork as close to traditional as I understood it. No pancakes and I serve this with rice. Looking at the picture it's not very colourful, bits of pale yellow and brownish black bits put together. All I can tell you is the flavour is simple but quite tasty, the meat is tender so is the scrambled egg. To pair with these are some crunchy vegetables of woodears, bamboo shoot and lily buds. Here is the recipe if you like to try. This recipe makes a dinner size plateful. * If you cannot find lily buds, can leave it out and add a handful of julienne carrot. Cut the pork into fine thin slivers. Mix with the marinade and leave for 15 - 30 minutes. Soak the woodears with warm water for about 15 - 30 minutes till they are softened and expanded. When soaking woodears make sure you do not let any grease or oil in contact before they are fully soaked or they will be limpy and not expanded to their maximum size. If the woodears are in large pieces cut into long thin strips. Rinse and leave aside. Also soak the dried lily buds in warm water till soften. Check there are no woody bit of stalk on some of the buds. If yes pick them out. Rinse, drain and leave aside. Beat the eggs and leave aside. Heat the wok till almost smoking add in about 1.5 tbsp of oil. Heat oil till very hot. Pour in the egg and spread it out, leave it to set for about few seconds, then stir and scramble the into bite size pieces. When the egg is slightly brown on the bottom take it out. Note: If you use very orangy yolk eggs, the scrambled egg will look more colourful. Heat about 3 - 4 tbsp of oil till very hot, add in the pork. Stir fry till pork is lightly browned. If the meat sticks together tease apart with the stirrer during stirring. Push the meat to one side of the wok. Without adding any more oil, add in garlic give it a quick stir till fragrant. Add in vegetables stir for a while then stir the pork into the vegetables. Add cooking wine and enough soy to taste with a pinch of pepper. Stir till hot, add a splash of water if you find this dry. Finally add in the scrambled egg. Stir and drizzle on some sesame oil. If you like the American way, you can serve this with steamed pancakes and hoisin sauce. Aldi sells that fungus? That's brilliant! I've eaten Mu Shu Pork many time here in China - it never comes with pancakes! Your recipe is pretty much how I've had served here. Just for people searching for this recipe, it's also called Mu xu rou.